100% Trail is a really beautiful race! 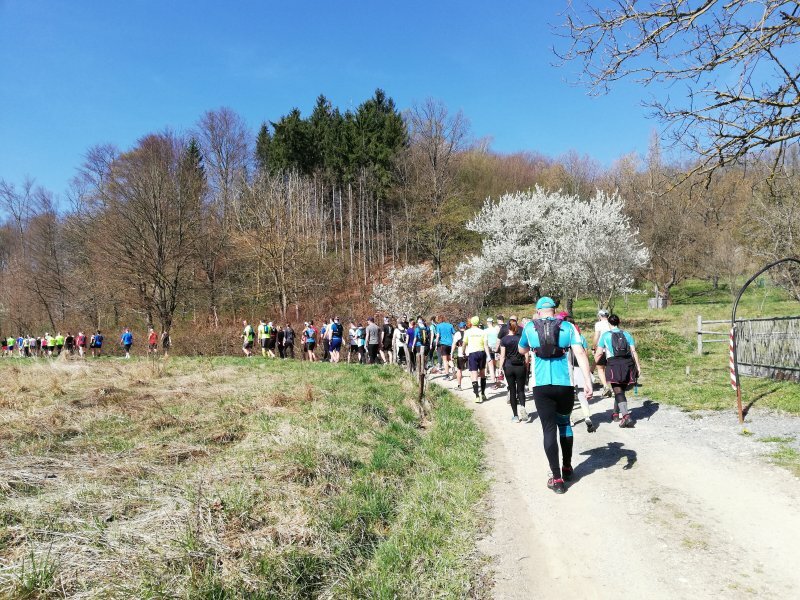 At the end of March the first race of the KontinenTrail League in 2019 was held, race 100% Trail, held in Rakov Potok. I had been preparing for the road race whole winter, so I went as a reward for the long and injury abrupted winter preparations. The last week of March, early spring, the forest warm and fragrant, and the weather beautiful and sunny promising a wonderful race. Rakov Potok is a place near Zagreb so there was no need for planning such as waking up very early and similar things that often accompany departing to distant destinations. The race offered three lengths of trail, Recreational (7 km), Brief (15 km) and Long (25 km). I was somewhat hesitant, but in the end I chose the Brief route. It seemed to me that 15 kilometers, for the first race of the new season, is a very good start. The usual way to get started is to prepare the last little things I do not even need, but I still like to have with me, picking up start numbers, drinking coffee, having fun with people. The start was some 5 minutes’ walk away from the place where we gathered and where the finish line will be. Competitors on the long and short run started together, and the Recreational run started a little later. A mandatory selfie and start. When it comes to the start it is common that everyone rushes ahead as if the goal is 100 meters and not 15 or 25 km, but to each their own. Everyone has a tactic that suits them. I like to make a slower beginning because I have time to get ahead later on the track. Those who are faster than me will be faster and I will not be able to reach them anyway, and those who have rushed forward and drowned… I will arrive and overcome them, and it is important to enjoy the race and not just chase. It started out really great on the path by the meadow and into the woods. At the beginning there was a small crowd because we had to cross over a stream. After the stream a little uphill. Then a little downhill, and then again across a stream. Then a bit by the stream and uphill on top another hill. And, again, downhill across another creek and by the creek, all the way to the first refreshment station. The short track had only the one refreshment station. Just enough. There were about 200 contestants on my track, while on the long track there were about 100, so it was interesting because at one point I was not alone on the path, so that was really nice. After refreshing and checking the numbers we are back on the track, and the track is magical again. It is more of the same ahead, in a stream and over a stream, then uphill and a bit more downhill. All of that in the forest over forest paths and roads. At one point the forest we were running through was so beautiful and so soft I wanted to take my shoes off and run the woods barefoot. It was wonderful. Some parts of the track were technically demanding and full of leaves, but this only made the beauty of the whole race bigger. The forest in the spring is wonderful. Not all of the trees have leaves yet, so you can see far in to the distance, but it still has greenery and spring flowers, so it smells fresh and bloomy. Also this forest along the Rakov Potok is particularly enchanting. I ended up with a solid result. I lost some time photographing on the track, and I was a bit slower on a demanding downhill slope because I didn’t want to get injured. The result did not worry me too much as this was just the first race of the season and I really wanted to enjoy the beautiful trail and the hot spring day. The race was set up by the members of the Sports Association Izohipsa from Samobor. Its particularity is primarily the fact that it is in the woods of Starča in its entirety, but you will not retrace your steps once while on the track which also doesn’t cross itself at all, and the forest is not that big at all. I particularly liked this. Basically, the race was beautiful, very well organized, like all the races of KontinenTrail League. Thanks to Trail Running Croatia for allowing me to participate in this wonderful race. I need to come again because the 100% Trail is a really beautiful race.